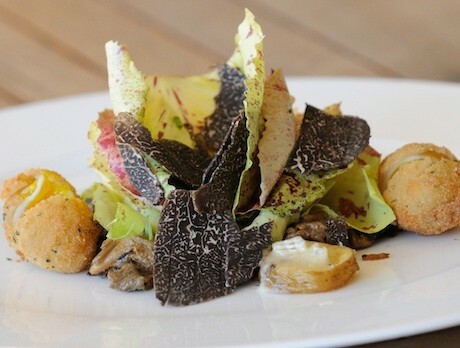 Truffle salad at Silver Oak. All photos by Janna Waldinger/Art & Clarity. On a gloriously sunny day on a recent weekend in the Napa Valley, standing among a group of people at the Robert Sinskey Vineyards, I watched a dog try to dig up a truffle. Apparently there were none to be found. We were told we had to wait at least another two years! 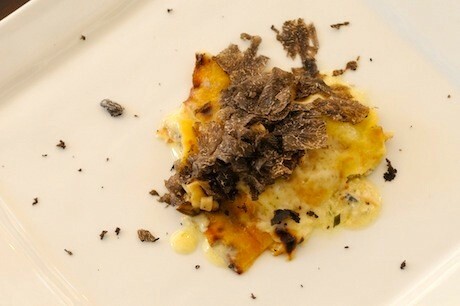 Surprise—an American truffle festival with no American truffles? Did I not read the literature carefully? I had been invited by IFWTWA, a writer’s group that I belong to, to the Napa Truffle Festival in the Napa Valley, a gluttonous food and wine extravaganza over a long weekend. Thank goodness there were plenty of French truffles on hand for tasting! There we met Dr. Paul Thomas and Robert Chang, a couple of very bright guys who are betting the bank that yes, we, too, can grow the most expensive food in the world, the black or Périgord truffle, which is a French winter truffle, and the Burgundy summer truffle. But it takes about five years of hoping after planting oak trees that are inoculated with truffle spores. The folks at the Sinskey Vineyard planted them three years ago, as have scores of other farmers who are working with the group. Never mind, I hadn’t come expecting to become a truffle grower even though the idea of making $3,500 a kilo is nothing to sneeze at, but as impatient as I am, I can’t imagine watering and waiting five years, never knowing for sure if it would work out. That said, there are plenty of others more patient than I. Luckily there was a treasure trove of French truffles to taste here, and by the end of the weekend we (my two foodie friends and I) were packed to the gills with the fragrant subterranean mushroom. On Friday and Saturday we had two extravagant lunches at two spectacular vineyards: Silver Oak and Beringer. I had no idea that Beringer had been producing wine since the late 1800s. My very snobbish French-preferring wine palate was becoming more open to big California reds and chardonnays by the minute. Chickpea crêpe with truffles at Beringer. The Silver Oak estate was stunning, especially on such a warm and sunny day, and the dining room was open to the outside terrace. Pizza with truffles, and then chicory salad with truffles and fried quail eggs, was served with Silver Oak’s Twomey Pinot Noir to start the lunch. Mains were ibérico pork and truffles with Silver Oak’s 2008 Alexander Valley wine, followed by a truffle-infused cheese course served with its Napa Valley red from 2008. And that was just lunch! Thankfully we didn’t sign up for the five-course dinner that night. Instead we toughed it out at the Bounty Hunter, which serves up some mean barbecue right in the middle of the adorable village of Napa. The night before, we had hit up two fabulous places in Napa, discovered by my friend and former food writer Kelly Page. The Thomas was perfect for some oysters and martinis before settling down to a dinner of tapas at ZuZu next door. The area, needless to say, is a foodie mecca and wine lover’s dream come true. I have a house in the Bordeaux region, so I’m used to this kind of experience, but even I was impressed. What was so refreshing was how relaxed and friendly everyone in the region was, and how every café had killer food with fresh ingredients grown right in the county. 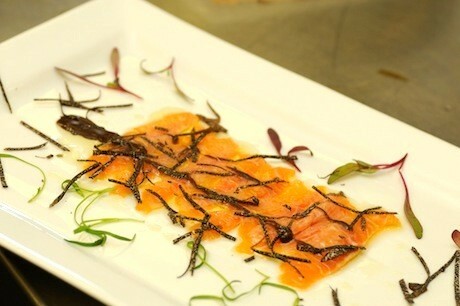 Salmon crudo with truffle at Beringer. Saturday’s lunch at Beringer was somehow even better than the one the day before. The guest chef that day was Nico Chessa from Valentino Santa Monica, a restaurant I remember from back when I lived in Los Angeles many moons ago. We were treated to a cooking demo by the very Italian Nico, who prepared three dishes for us in a simple manner, making me feel as if I could redo it all at home. After a tour of the vineyard, we sat down to Artic char crudo with truffles and pesto—not the ideal combo, as they fought each other a bit—but the reserve chardonnay from 2011 was luscious. Courses two and three were winners, making it hard to decide which was best: the chickpea crêpe served with ricotta Parmesan mushrooms and truffles or the pork sausage with polenta, a poached egg and truffles. I’d love to have them both again to determine for sure. 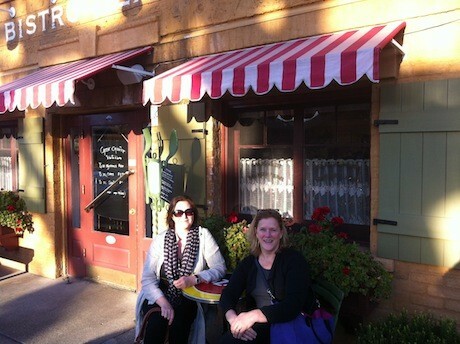 Doni with Whole Foods executive and good friend Carolyn Falco at Bistro Jeanty in Yountville. More yummy Frenchness. My favorite part of the weekend besides catching up with my two buddies was the mushroom hunt on Saturday morning. 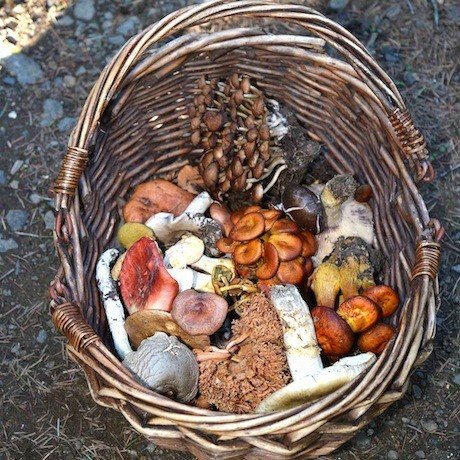 We must have found 15 different kinds of mushrooms in the woods that day, only a few being edible. 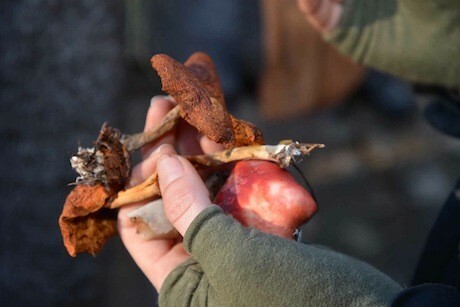 Mushrooms are beautiful creations, and hunting for them requires you to slow down and really appreciate the woods, the flora and fauna, which for me is a rewarding experience that reminds me of searching for morels with my dad when I was a kid. Just to really push us over the edge, Sunday found us at the Oxbow Public Market with an insane amount of truffle dishes to taste. The roast beef and truffle mayo sandwich was memorable, as was the truffle enchilada. This five-year-old institution is one of the most charming I’ve ever been in, and that includes French markets. It is, however, resoundingly American—very “Napa” if that’s a term. While I don’t think I’ll be growing truffles anytime soon, I did fall in love with the Napa Valley and am ready to move there for half the year as long as the other half can be spent in France! The French apparently agree with me, as 1,300 grape-growing acres in the Napa Valley are owned by French families or companies. In fact, the French helped establish the area as a wine-growing region back in the 1850s. Georges de Latour founded Beaulieu in 1900; in 1973 Domaine Chandon was the first sparkling-wine producer outside Champagne to set up shop; and Mumm Cuvée Napa was started by the French Mumm’s Cordon Rouge. Dominus in Yountville is owned by Christian Moueix, owner of Château Pétrus in Bordeaux, and the list goes on. So if I spend half my year in Napa and half in Bordeaux with frequent stops in Paris, I’ll be in good company, don’t you think? Want to know more about cultivating truffles anywhere in the world? Contact American Truffle Company. Editor’s note: When in Paris, don’t forget to sample some of the city’s trendiest wine bars. Ô Chateau, a GG2P Travel Club partner, offers our members a glass of wine on the house.